The advancement of technology and enhanced communication go hand in hand. Once upon a time, designated messengers would travel via horseback on weeks-long journeys to deliver news from one party to another. Today, it’s as simple as picking up your smart phone. Those same messages that used to take months can now traverse the world in a matter of seconds. For marketers, this means opportunities abound to communicate to current and potential customers—and behind every strong marketing message is a call to action. Where should my calls to action appear? Calls to action can come in many forms—from the copy on a print ad to a banner graphic on your website. The placement of a call to action depends on what exactly you are asking people to do. For example, if you’re asking followers to visit your website, you wouldn’t place that call to action on your website because obviously, they are already there. If you’re asking people to sign up for your email list, you wouldn’t place your call to action on a billboard, because people are driving and can’t enter their emails right then and there. Does every marketing message need a call to action? The short answer—no. However, every marketing effort is indirectly pushing some larger initiative. For example, if your business posts to social media every day or even multiple times a day, it could start to annoy followers if they feel like every message is trying to sell them something. There’s nothing wrong with posting something sans call-to-action about the “beautiful weather we’re having” or a simple “did you know” with a fun fact. These posts serve to build a rapport with your clientele even though the posts themselves aren’t shouting at them to do something. We suggest mixing posts like these with call to action posts to find a good balance. Beyond your daily social media posts, we would say calls to action are necessary for most all other marketing efforts—especially those that are less fleeting. Keep in mind that a call to action can be as simple as, “Click here” or, “Try it today.” Beware, though of “weak” calls to action that can seem desperate to your brand followers. To avoid being bland and appearing desperate, check out these tips for strengthening your calls to action. Use strong verbs. Let’s go back to elementary school for a minute. They taught us that instead of saying, “We went to the store,” we should say, “We ran to the store,” “We jogged to the store,” or “We skipped to the store.” Action verbs, people! It is a call to action, after all. In a call to action format, use action verbs to clearly communicate what it is you want people to do. “Download our resources.” “Subscribe to our newsletter.” “Comment on our blog.” “Request more information.” “Speak to a member of our sales team.” Also, don’t muddy up your message with unnecessary words. “Give us a call now!” is admittedly weaker than just saying, “Call us now!” Action verbs are your friend in marketing. Be specific. This goes along with using strong verbs and being concise. “Come see us today,” is a pretty weak call to action vs. “Pick up a pair now!” or “Drive away in your new car today!” The first example, “Come see us,” begs the question—come see us to do what, exactly? Evoke emotion. “Call us today” vs. “Call us today!” Which one is more engaging? If you’re like us, the first one makes you think of a bored employee in a call center droning away in a monotone voice. Your call to action should be enthusiastic because you want your audience to be enthusiastic about following through with your request. Tell people why they should do what you’re asking. Selling can be a tough gig, especially these days when there is so much competition. People need to know exactly why they should agree to your call to action. In other words, tell them what they’re missing out on by not doing it. For example, “Visit our website to get your free coupon,” is better than just saying “Visit our website.” It incites action (visit our website) and the reason why (to get your free coupon). Get creative. Don’t be afraid to inject some personality into your calls to action. People respond better to language that is conversational and casual rather than stiff and systematic. For example, a call to action that says “Shop our lawnmowers now!” could be made better by saying “Cut down on your weekend chores starting today!” This also goes back to tip No. 4, giving people a reason to want to complete your requested action. Creativity can also come in not just the way you say things, but what you’re saying. Website visits and phone calls are pretty standard. But you could also implement ideas like “Be the first customer in the store today and win a gift certificate,” or the post a picture with our branded hashtag example from above. 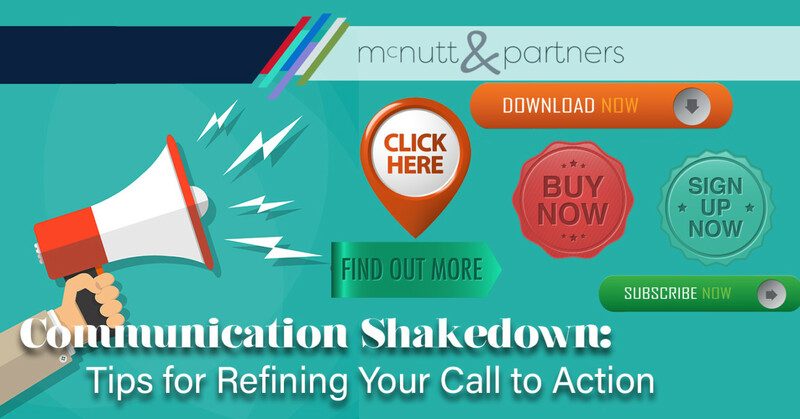 Calls to action are a critical component of your marketing messaging. Successful calls to action vs. weak ones can make the difference between whether your brand prospers or perishes.